Have you been searching for an Airstream dealer in your area but are not sure where to start your search? Wanting to find a large selection of new and used Airstreams for sale including many Airstream Bambi trailers for sale? If so then you need to come to your local Airstream dealer in Franklin, Wisconsin and see one of the many new and used cars for sale. Here at Ewald Airstream of Wisconsin, we understand that when it comes to finding a new or used Airstream for that fits your wants and needs the process can seem never-ending. We also know that each person that walks through our doors here at your local Airstream dealers is each person is going to have different wants and needs. Which is why we have a team of people who are happy to answer any and all questions you may have about one of the many new and used cars for sale. That includes questions about the all-new Airstream Basecamp for sale this Airstream camper for sale comes with many features both inside and out that you will not want to miss. This Airstream Bambi trailer for sale is light enough to be easily towed from place to place, and with its single axle design, you can haul it with just about anything.This Airstream trailer for sale is perfect for a couple to enjoy a romantic getaway with an easy to convert sofa bed that gives you plenty of seating space and room to move around. Never feel cramped in this Airstream camper for sale because with ample storage space everything has a place and there is a place for everything in this Airstream for sale. The Airstream Basecamp comes with a full kitchen with stainless steel appliances that make it a breeze to cook and prepare your favorite meals. The Basecamp is meant to feel like a home away from home with many customizable features both inside and out. While adding to the beauty of nature instead of taking away from it. Bring the outside in with panoramic windows, which make this Airstream trailer for sale feel light and bright. Count on the Airstream Basecamp to last far longer than its boxy competitors, and with its lightweight and sleek design, you will not even feel the impact at the pump. The Airstream Basecamp was designed for everyone to enjoy, small enough not to need a large truck but with enough space to feel at home. Plus with its compact size this Airstream trailer is a dream to haul, and with anti-sway technology along with its short body ( only 16’3”), everyone from a first-time trailer owner and tower, to a veteran trailer owner can drive it. 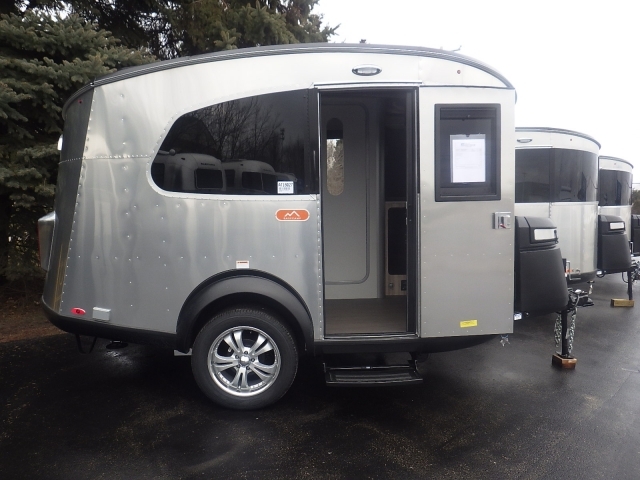 When you are looking for sure-footed trailers that can take you off the beaten path come and see the all-new Airstream Basecamp for sale in Franklin, Wisconsin. When you are looking for an Airstream for sale near you come to your local Airstream dealer in Wisconsin When you are looking for an Airstream dealer near you come to Ewald Airstream at 6269 S 108th St, Franklin, WI 53132.